Michelle Blair ’12 co-presents the Woods Ring to her daughter, senior Ashley Grochowsky, immediately after receiving her own ring. Michelle Blair ’12 proclaims her love for Saint Mary-of-the-Woods College to anyone who would listen. Since becoming the owner of her very own Woods Ring following the ceremony on Saturday, Blair could now express her love for The Woods another way: by wearing it proudly. “Saint Mary-of-the-Woods is a magical place for me. It helped me attain my goals. My life would be so different if I hadn’t come here,” said Blair, who completed a degree in psychology from SMWC’s Woods Online program. When she first became eligible to receive the Woods Ring, Blair’s two children were still in high school; the family was facing many expenses and decided to forego purchasing the Woods Ring. Seven years later, and after countless times telling her family how much she wants to have a Woods Ring, Blair’s husband Trace and daughter Ashley Grochowsky — a Woods Online senior majoring in business administration — decided to surprise her with her very own ring. Blair and Grochowsky were among 87 ring recipients at the 97th Ring Day ceremony on Saturday. It was an emotional ceremony for the mother-daughter duo. 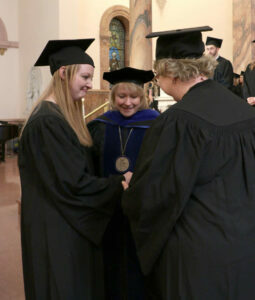 Blair was first to receive her ring from SMWC President Dottie L. King, Ph.D. before turning around to co-present the Woods Ring to her daughter. Grochowsky, a resident of Newton, Illinois along with her mother, describes the ring as her legacy, which is the main reason why she chose to get it. Judy Coulup Hund ’87, a member of the SMWC Board of Trustees, delivers the reflection during the ring ceremony on Saturday in the Church of the Immaculate Conception, Saint Mary-of-the-Woods. Families, students, faculty, staff and alumni packed the Church of the Immaculate Conception for the time-honored tradition. Students at SMWC have been receiving the ring since 1922. 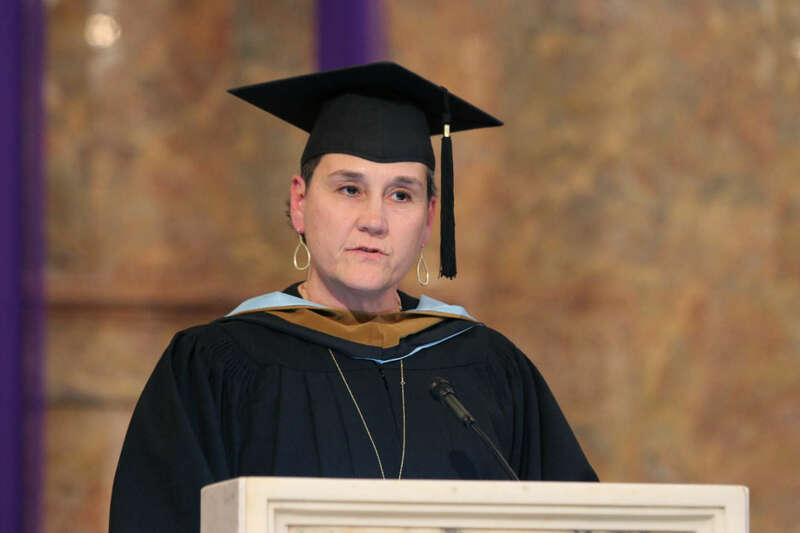 Judy Coulup Hund ’87, a member of the SMWC Board of Trustees, spoke about the significance of the ring during her reflection speech. 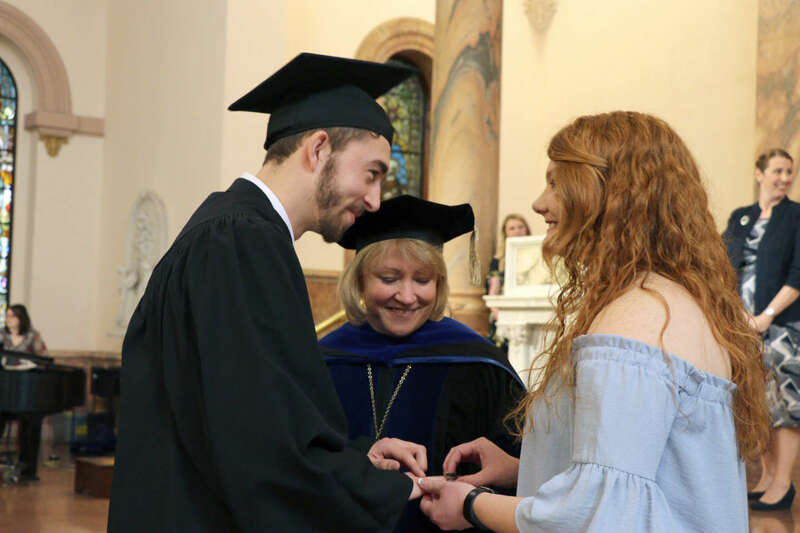 “It [the Woods Ring] is quite a powerful reminder to have on your finger such an outward expression of the care and commitment for each other and our world, all while being empowered by the spirit of Saint Mother Theodore Guerin,” she said. Family members and alumni far and wide traveled to SMWC to celebrate with the undergraduate and graduate students who received the ring this year. The ceremony was followed by a reception in O’Shaughnessy Dining Hall featuring an elaborately decorated cake inspired by the Onyx ring bearing the SMW insignia. For Earl Wilhelm of Aurora, Indiana, the ring is a reminder of his hard work. It means he is close to completing his bachelor’s degree. “My wife got her ring last year and I’m getting mine this year. We’ll both be graduating at the same time,” he said. 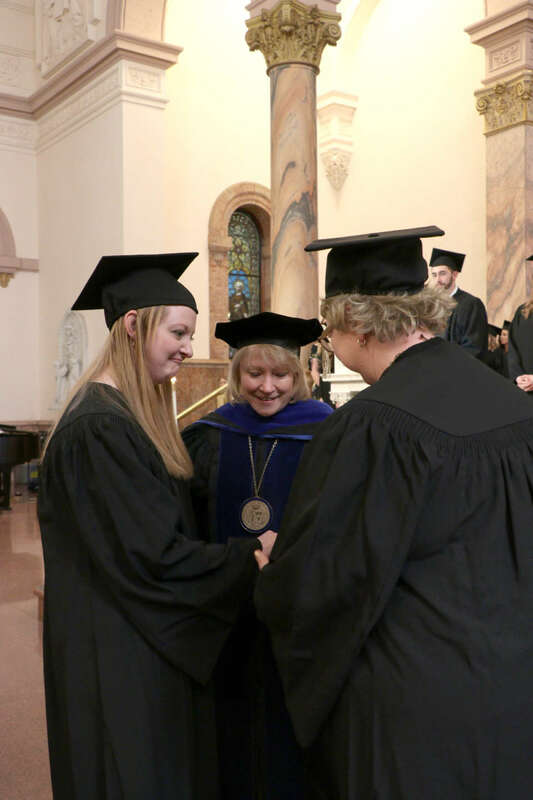 Logan Thralls, a descendant of the couple who welcomed Saint Mother Theodore Guerin to the area in 1840, receives his Woods Ring on Saturday in the Church of the Immaculate Conception from SMWC President Dottie L. King, Ph.D., and co-presenter Shannon Sonderman ’18. For one ring recipient, the family connection to The Woods runs longer and deeper. Logan Thralls, the great-great-great-great grandson of Joseph and Sarah Thralls —who opened their home to Saint Mother Theodore Guerin and her five companions when they arrived at The Woods in 1840— had key roles to play during the ceremony: candle holder and reader. As junior class treasurer, Thralls was one of the organizers of the event. The psychology major from West Terre Haute said Ring Day is something he didn’t realize he could look forward to until he had the chance to attend The Woods when it became co-educational. When he heard, “I knew this is going to be my place. This is Providence coming toward me,” he said. “This ring represents everything that has become of what used to be just farmland,” he added.